Q. Adaptive control process in motor-speed control system? 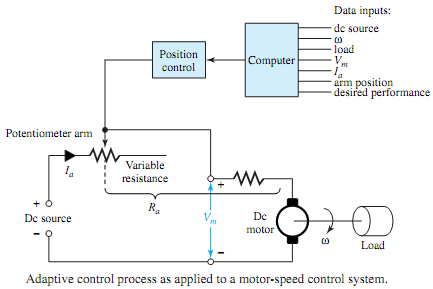 Figure illustrates the adaptive control process as applied to a motor-speed control system, which is based on adjustments of the armature resistance. Using all of the data inputs, the computer computes the optimum value of Ra such that the motor speed is appropriate to the load. The signal corresponding to the computed value of Ra is in turn used to position the potentiometer arm of the variable resistance. The actual armature resistance is then controlled by the position of the potentiometer arm, which in turn may be controlled by a sampled-data version of the position-control system. The speed and power of the digital computer (in predicting the response to a wide range of changes that affect the system) are the main reasons for the use of adaptive systems in industrial control. Large-scale systems may have multiple inputs applied simultaneously, and control is successfully achieved because the process of predicting the desired response, and comparing with the actual response, can be accomplished in a relatively short time compared to the response time of the system to be controlled. Trap is called as Non-Maskable interrupts, which is used in emergency condition. What is memory paging? The memory paging mechanism located inside the 80386 and above permits any physical memory location to be assigned to some linear address.